I note that the American Civil Liberties Union is recognizing Feb. 12 as the birthday of Abraham Lincoln. 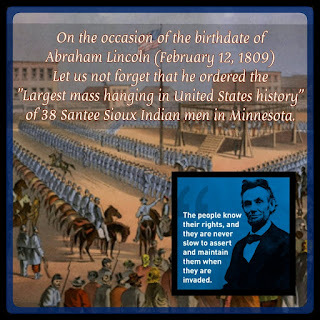 Let us not also forget that under the order of Abraham Lincoln, on December 26, 1862, thirty-eight Santee Sioux Indians dangled lifeless in the air. A spectator boasted that this was "America's greatest" public execution." A memorial to the memory of the dead now stands in downtown Mankato in Reconciliation Park. Abraham Lincoln - DOB: February 12, 1809.